Fire is classified with respect to the ground, target, and the MK 19.
a. Respect to the Ground. Normally, this means either plunging or grazing fire. However, since grazing fire is not practical for use with the MK 19, only plunging fire will be considered. Plunging fire strikes the target from a high angle and confines the danger space to the beaten zone. 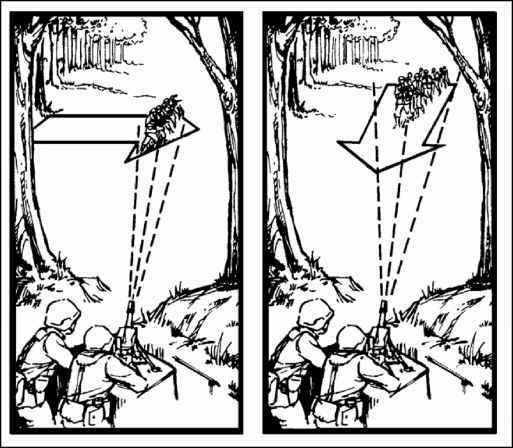 For example, when fired from the top of a hill, projectiles follow an arcing trajectory and land in the valley (Figure 5-1). (2) Flanking. This type of fire is delivered against the flank of the target. (3) Oblique. This type of fire is directed at a target moving at any angle other than directly toward or perpendicular to the gun. (4) Enfilade. This type of fire occurs when the long axis of the beaten zone coincides with the long axis of the target. Enfilade fire may be frontal or flanking, depending on which way the target is facing. For example, frontal enfilade occurs if the MK 19 is in the middle of a road and the target is approaching on the same road. 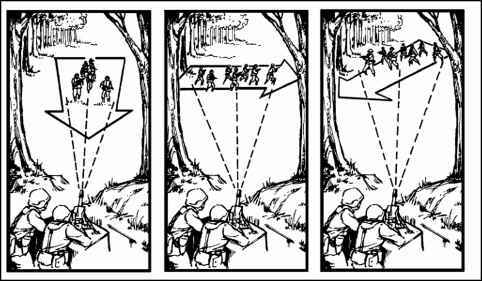 Flanking enfilade occurs if the target is moving either way, left or right, yet is still in a long axis configuration away from the MK 19. Figure 5-2a. Classes of fire with respect to the target: frontal, flanking, and oblique fires. Figure 5-2b. Classes of fire with respect to the target: flanking and frontal enfilade fires. c. Respect to the MK 19. 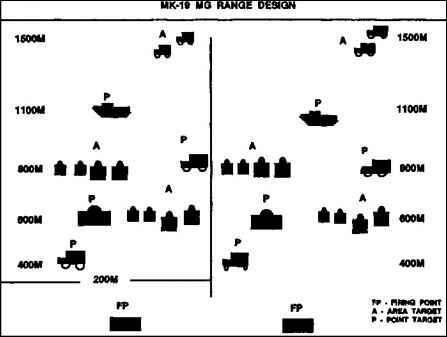 Fire from the MK 19 may be conducted in six ways (Figure 5-3). (1) Fixed. Fire is delivered against a target with one aim point, which concentrates the beaten zone. (2) Traverse Fire is moved from left to right or right to left, with no range change. It may be used against frontal or flanking targets. (3) Search. Fire is directed against a deep target. Elevation changes are made, but direction changes are not. Searching fire is used against enfilade targets. 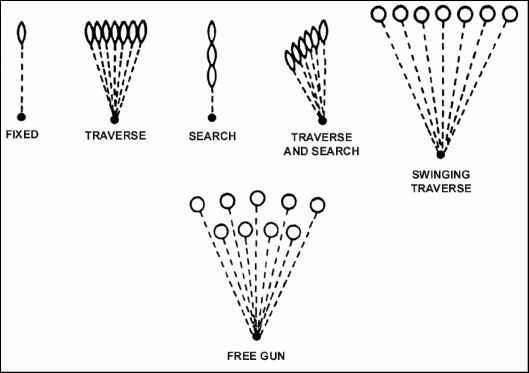 (4) Traverse and Search. This is a combination of traversing and searching fires used against a target with depth and width (most likely an oblique target). (5) Swinging Traverse. This fire is slightly different from traversing and searching. Although it is delivered against a wide target, with major changes in direction, no elevation changes are made. To deliver fire using a swinging traverse, the gunner releases the traversing slide lock, allowing the gun to travel freely across the traversing bar. (6) Free Gun. Fire is delivered with the T&E mechanism removed and is used when quick changes in direction and depth are needed to engage moving targets. Figure 5-3. Classes of fire with respect to the MK 19. Is a mark 19 used for plunging fire?